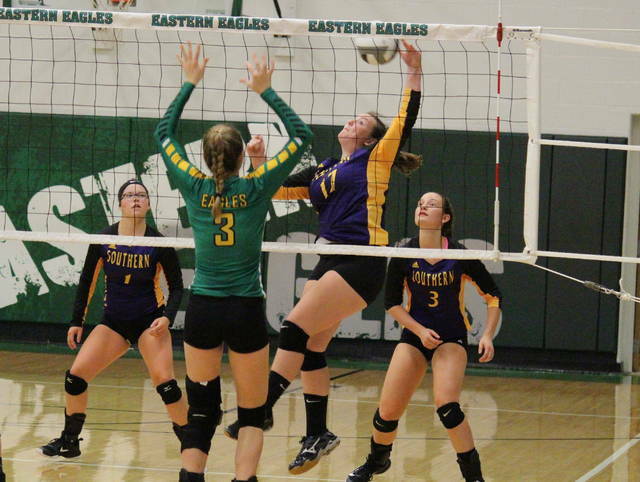 Eastern senior Allison Barber (1) spikes the ball over the net, during the Lady Eagles’ straight games win over Southern on Wednesday in Tuppers Plains, Ohio. Southern senior Baylee Grueser (15) hits the ball over the net from the back row, during the Lady Tornadoes’ loss on Wednesday in Tuppers Plains, Ohio. TUPPERS PLAINS, Ohio — Back in ‘The Nest’, and with some momentum. 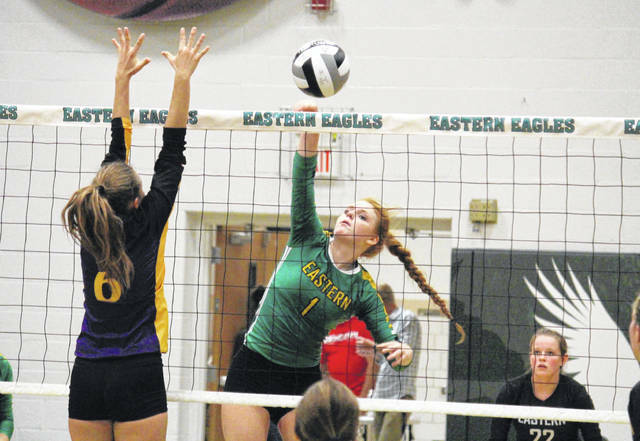 The Eastern volleyball team picked up its third consecutive victory in its first home game of the season, with the Lady Eagles claiming a straight games win over Tri-Valley Conference Hocking Division rival Southern on Wednesday night in Meigs County. 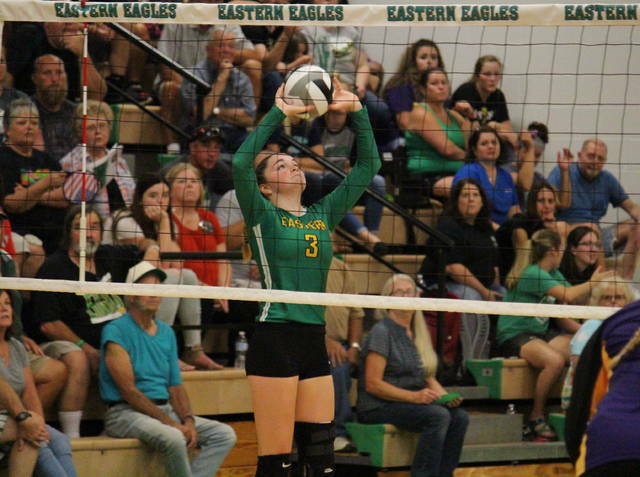 Eastern (3-1, 2-0 TVC Hocking) began the opening game with a 3-0 lead, but surrendered five straight points to the Lady Tornadoes (0-4, 0-2). EHS regained the lead at 6-5, fought off ties at 6-6 and 8-8, but never trailed again on its way to a 25-13 victory in the first. The Lady Eagles scored the first seven points of the second game and extended their lead as high as nine, at 19-10. Southern trimmed its deficit to just one point after claiming six straight markers against game-point, but Eastern finally shut the door and took the 25-23 win to move ahead 2-0 in the match. After a pair of earlier lead changes in the third game, Eastern took the advantage at 7-6, fought through a tie at 7-7, and controlled the game the rest of the way. The Lady Eagles led by as many as 10 points and settled for the 25-18 triumph to seal the match. Following the victory, first-year Eastern head coach Mykala Sheppard noted her team’s ability to over come adversity in the match. “They struggled to finish, but they were able to figure out how to do so,” said Sheppard. “They overcame giving Southern a couple points here and there, and were still able to take care of business. We need to work on finishing and communication, and we have to refine our hitting targets. Lady Tornadoes head coach Kim Hupp acknowledged that, while some areas have improved for her team, focus remains a key issue. 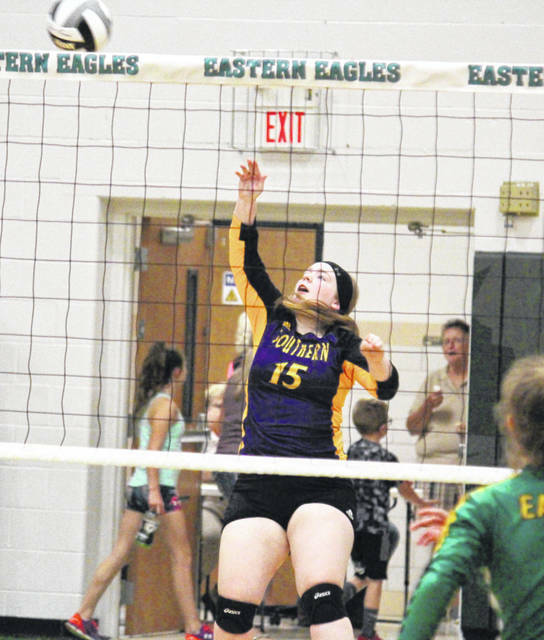 Eastern held a 41.8-to-30.1 advantage in side-out percentage, while the Lady Tornadoes claimed a 92.7-to-91.8 edge in serve percentage. EHS senior Kelsey Casto led the service attack for the victors, recording 16 points, nine of which came in the second game. Three of Casto’s match-best 16 points came on aces. Caterina Miecchi marked 10 service points and a match-high six aces for the hosts, Jenna Chadwell added seven points, while Kylie Gheen came up six points and one ace. Alexus Metheney finished with five points and three aces for the Lady Eagles, Allison Barber had four points and a pair of aces, while Haley Burton chipped in with two points and one ace. Layna Catlett rounded out the EHS service with one point in the win. Southern’s service attack was led by senior Baylee Grueser with 10 points and one ace. Phoenix Cleland had nine points and one ace for SHS, with six of her markers coming in the second game. Marissa Brooker and Kassie Barton both finished with five points in the setback, with Brooker earning a team-high two aces. Peyton Anderson had two points and one ace for the Purple and Gold, while Baylee Wolfe finished with one service point. Miecchi led Eastern at the net with a dozen kills. Allison Barber posted five kills and one block for EHS, Catlett had three kills and two blocks, while Gheen had one kill and one block. Chadwell and Olivia Barber each contributed one kill to the Lady Eagle cause, while Sydney Sanders had a team-best nine digs. Saelym Larsen led the guests at the net with four kills and one block. Wolfe had two kills and two blocks, Cleland added one kill and three blocks, while Abby Cummins finished with one block in the setback. These teams are slated to clash again on Sept. 25 at SHS. Both teams will be back on their respective home courts on Tuesday, with Eastern hosting Federal Hocking and Southern welcoming Waterford.